I think I first heard about LowerYourBidPrice’s split testing tool from Amit Mehta on his superaffiliatemindset blog but it was Kirt Christensen who gave a great presentation on the benefits of using WinnerAlert and how it can help you continually improve your google adwords campaign. For those of you who dont know what WinnerAlert does – Its simple – it send you an email when you have a winning adgroup. They have recently added additional functionality so that you can test which adgroup converts to sales better instead of testing click thrus. 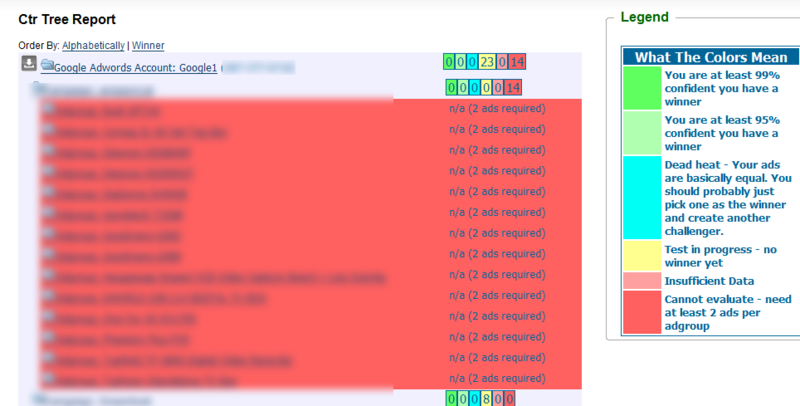 Yes I know the red indicates I haven’t setup my adwords account correctly on my first campaign. Its on my todo list :). Anyways, Why would you need this ? If you are have a large adwords account or managing other google adwords you want to be notified when there is a winning ad so you can write another one. This way you keep making continual improvements. They offer a free trial here. If you signup through my link – I get a small comission – let me know and I will take a quick look at your adwords account to see if its setup correctly. Im using it myself and finding it helpful in keeping me organized with my adwords campaigns. WinnerAlert – Worth Checking Out.